Research - Maybe Oumuamua Was An Alien Spacecraft? For a year, scientists have been studying data gathered about the large, cylindrical object that sailed through our solar system last December. Now, two say that maybe it really could have been an alien spacecraft. From its speed and trajectory around our Sun, scientists pretty much agree that the object named Oumaumua came from outside our solar system. It appeared to be a reddish, rocky, cigar-shaped object some 400 meters long. That's just too long to fit the common profiles of an asteroid or comet. Two Harvard University astronomers wrote in the 12 November edition of The Astrophysical Journal Letters (.pdf link) that they conducted a mathematical analysis of of the way the interstellar object increased its speed as it shot past the sun. From this, they believe that Oumuamua could have been pushed through space by light falling on its surface, possibly by a "lightsail of artificial origin" that "may be a fully operational probe sent intentionally to Earth vicinity by an alien civilization". In other words, a Spacecraft that is pushed along by photons of light the same way a boat's sail is pushed by the wind. 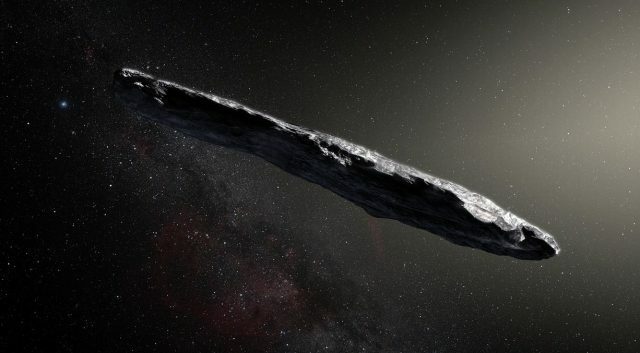 "It is impossible to guess the purpose behind Oumuamua without more data," cautions Avi Loeb, chairman of Harvard's astronomy department, who wrote the paper with Shmuel Bialy, a postdoctoral fellow at the Harvard-Smithsonian Center for Astrophysics. They admit their proposal as "exotic". Getting more data is unlikely, since scientists didn't know Oumuamua was coming, and only began observations when it was 33 million kilometers from Earth and heading away from the Sun. And without more facts to work with, the Harvard duo haven't convinced fellow scientists. "It's certainly ingenious to show that an object the size of Oumuamua might be sent by aliens to another star system with nothing but a solar sail for power," said Seth Shostak, a senior astronomer at the SETI Institute in Mountain View, California, wrote to NBC News. "But one should not blindly accept this clever hypothesis when there is also a mundane (and a priori more likely) explanation for Oumuamua - namely that it's a comet or asteroid from afar." "In science we must ask ourselves, 'Where is the evidence?,' not 'Where is the lack of evidence so that I can fit in any hypothesis that I like?'" said Coryn Bailer-Jones, an astronomer at the Max Planck Institute for Astronomy in Heidelberg, Germany. "One can always come up with increasingly implausible suggestions that have no evidence in order to maintain an idea." But Loeb insists his suggestion is "purely scientific and evidence-based". He says, "I follow the maxim of Sherlock Holmes: When you have excluded the impossible, whatever remains, however improbable, must be the truth."